Get the upper hand in this tough but spectacular fight. 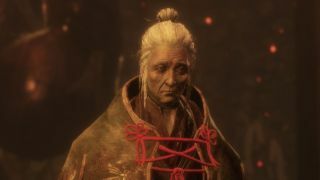 Lady Butterfly is an optional boss that can be encountered early on in Sekiro: Shadows Die Twice. She's located at the end of the Hirata Estate and you'll be able to gain access to her after you've defeated Juzuo the Drunkard by proceeding to the building directly behind him. You'll need the Hidden Temple Key obtained from the NPC you encounter after the Shinobi Hunter boss fight. Before heading down the stairs to use the key, check the wounded NPC after you've taken down the lone archer to receive Snap Seeds which can help in the second phase. Lady Butterfly has two phases and you'll need to break her posture twice to defeat her. The posture gauge recovers more slowly as vitality is reduced so don't be disheartened if it seems like an impossible task at the beginning. Keep chipping away at her health and her posture gauge will become easier to fill. The room where you'll fight Lady Butterfly is a fairly large, rectangular room with pillars running down either side which you will be able to use to your advantage. When you engage the boss, she will do one of two things; she'll either hurl a fan of knives at you or she'll close the distance quickly with a flurry of attacks. Either way, be ready to dodge clear. It's best to stay as close to Lady Butterfly as you can in this phase as she'll resort to hurling knives if there's any distance between you. She'll do her best to take you down with various combo attacks, so either deflect them or dodge to the left and counterattack. She'll also do a sweeping attack that you can't deflect but a red icon will appear above your head, prompting you to jump over the attack. If you do take damage, you can back away and use a pillar to shield yourself from her knives while you use your gourd. Another of Lady Butterfly's attacks to watch out for in this phase is when she jumps into the air to balance on wires that are strung out between the pillars. A red icon will appear over your head, allowing you to use a shuriken to knock her off balance (equipping the Loaded Shuriken on your Shinobi Prosthetic is useful for this), otherwise, be prepared to dodge to the left to avoid her devastating attack. Another aerial attack to look out for will see her jump quickly—as if from pillar to pillar—but then immediately try to land on you, again for devastating damage so get ready to dodge. Remember that you can attack right after a dodge with a slash that will inflict extra posture damage. Lady Butterfly is particularly open to this at the end of her flurry combos. Lady Butterfly will keep most of the same attacks during phase 2 but will summon illusions, just to make your life that little bit more difficult. You can deal with these in one of two ways; either use the Snap Seeds that you acquired before entering the boss room to disperse most of the illusions or run around the edge of the room until they dissipate. Aside from the illusions, Lady Butterfly will also summon balls of light that will track you to explode for a lot of damage. These cannot be deflected but are easy to dodge by side-stepping. Keep up the pressure on her as you did in the first phase and you'll soon make short work of her.